At March 31, 2016 EXOR’s Net Asset Value (NAV) is $12,389 million; this is a decrease of $966 million (-7.2%) compared to $13,355 million at December 31, 2015. Following the investment in PartnerRe, which was completed in March 2016, the total exposure of the assets held by EXOR denominated in US dollars increased and therefore starting from January 1, 2016 NAV and its performance are reported in US dollars. The benchmark has also been changed and is now the MSCI Index in US dollars. Finally, consistently with EXOR’s intention to cancel its treasury stock, with the exception of the shares that will be used to service the incentive plans (already in effect or that will be submitted to the May 25, 2016 shareholders’ meeting for approval), EXOR, from January 1, 2016, expresses its NAV performance per share, at March 31, 2016 is $51.41 (*). 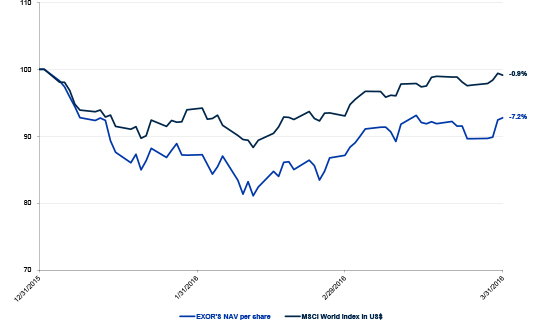 The gross asset value at March 31, 2016 has been calculated by valuing listed investments and other equity shares at trading prices, other private equity investments at fair value determined annually by independent experts and other private investment holdings (funds and similar instruments) at the most recently available fair value. Bonds held to maturity are measured at amortized cost. EXOR treasury stock is measured at share trading prices, except those used to service stock option plans (measured at their option exercise price, if below the share trading price) and those awarded to beneficiaries of the stock grant plan which are deducted from the total number of treasury shares. 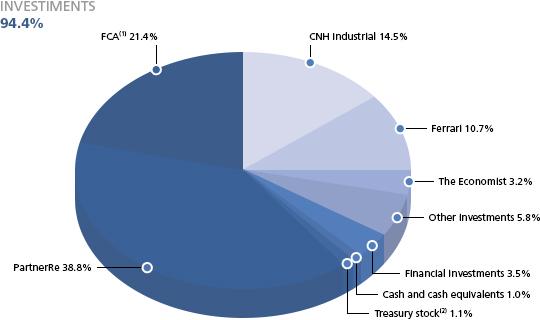 The following pie chart shows the composition of gross asset value at March 31, 2016 ($17,365 million). “Other investments” include the investments in Almacantar Group, Welltec, Juventus Football Club, Banca Leonardo, in addition to other minor investments. Investments denominated in Euro and Pound are translated to US dollars at the official exchange rates at March 31, 2016. (2) Net of treasury stock that will not service the incentive plans in effect or that will be submitted to the Mary 25, 2016 shareholders’ meeting for approval.